OOC: I pictured it out in the city, in some sort of alleyway. And it's Mindwipe, not Mindswipe. IC: MindwipeEven though Mindwipe could see the blasts coming, he could dodge every shot. He took one round to the arm, but it wouldn't impede him too much. He flew over to a rooftop and called for a squad of Vehicons both aerial and ground-based. Deltus had made a wrong move coming here.Nowhere to run, nowhere to hide, Autobot scum, he thought to Deltus.From every direction, including above, a whole squad of Vehicons surrounded Deltus. It would me nigh impossible to escape this. IC: ShatterquakeHey, Painkiller. Ya mind sending me this Alphonic guy's file?Shatterquake kept going, keeping pace relatively well. His feet left claw marks in the ground wherever they struck. Edited by Deltus, Jul 17 2012 - 07:48 AM. OOC: See that text on the main post that says you are not infinitely superior to enemy NPC's? It's some of my favorite text. Really, I came up with it. I rather like it.A cartoon is just that, a cartoon. The good guys have to win or at least, survive, for it to continue to make money. This RP doesn't have to make money. You know what that means?I think you do. Cartoon logic doesn't apply here, please, everyone, remember that. Edited by Basilisk, Jul 16 2012 - 09:45 PM. OOC: Deltus, I've discussed this with Basilisk many times. Many times. I agree, and he will never, ever surrender on this point.Isn't that right, Basilisk? OOC: Thank you, Basilisk and everyone else! See, when the Vehicons are being controlled by staff (or anyone for that matter) , that means you can't auto-hit them, let alone blast through a whole squad of them. Edited by Zyke the destroyer, Jul 16 2012 - 09:48 PM. OOC: Zyke, can you respond? OOC: *Pokes head out from under mountains of fortifications and artillery pieces*What was that Kray? Hard to hear you over the sound of my fortress of INFINITE NPC POWER. IC - Crosswise: "Hey Firestorm, what do you do for fun anyways?" Crosswise slowed down behind Shatterquake and Painkiller. He seemed to cringe for a moment as he noted the pained expression on Shatterquake's face as he transformed. He didn't feel like asking Shatterquake anymore questions at the moment and whistled as they made their way to the Command Tower.IC - Flatline: "The Vehicon seems perfectly fine at the moment, sir. While I do see possible concerns, Warlord Magmatron has issued out an order. I don't wish to have my spark extracted and fed to him as the current rumors spread by the other medics have led me to believe. Please inform me when a new mission is issued out, I shall be embarking on it as a part of either your unit or Burning Sky's seekers." After finishing the transmission, Flatline exited the research division. He transformed and made his way to the mess hall, famished from the time spent in the Underworld Mountains. OOC: Oops, didn't see that.IC: "Board the dropships. If you must entertain yourselves, do it on the way." Alphonus transformed and drove over to the convoy of dropships. IC: Grindcore"I've also stationed some medics equipped to perform the 'Maximal' procedure (that's what I'm calling our beast mode troopers) on the ship, if any one of yours wants to have a beast mode," Grindcore told Alphonus via comlink. Edited by Zyke the destroyer, Jul 16 2012 - 09:56 PM. IC: "Oh Great Primus, why?" he privately said over the comlink to Grindcore. "I do not mind organics, but this is ridiculous...is it reversible?" As he said this, he boarded the main transport. Edited by TNG Prime, Jul 16 2012 - 09:59 PM. OOC: Aw, c'mon TNG IC: Grindcore"Of course," Grindcore told Alphonus, "once one undergoes the procedure, they can simply scan a vehicular mode if they so choose." 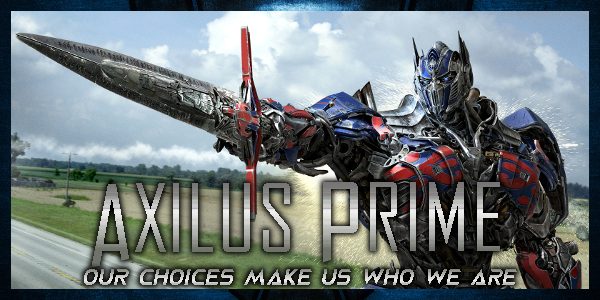 OOC: Like I said, he's sorta what I would be as a Prime. (Therefore more serious and lacking of most humor.) Therefore, since I don't like Beast Wars much...that happens. Cross between Self Insert and Young Bayverse Optimus. IC: Shatterquake"Oy, Alphonics, or whatever your name is!" Shatterquake yelled, transforming.Hey, Painkiller. Are you sure this bio is accurate? OOC: Can every member of Alpha Squad make sure their character gets on board one of the dropships? I'm going to have to go to bed soon. IC - Crosswise: The Autobot looked back at Firestorm as he made his way to a dropship. Crosswise scratched his head before sending another transmission. The Scout passed by some medics who had already begun modifying an Autotrooper's t-cog. He looked over to Shatterquake and Painkiller, waiting to board the same dropship as them. "How about something you do in your downtime between missions? "OOC: Since this is the Aligned continuity, I've always imagined the beast modes to look less like something from Beast Wars. The Predacons from G1 had beast modes but also had a coating of metal over it that couldn't fool anyone. The same thing occurs with the Dinobots and Insecticons. Thundertron from Prime also shows the same phenomena. I'm trying to justify how beast modes wouldn't grant Cybertronians a weakness to diseases. In any case, what I'm trying to say is that the altered transformation-cog merely gives them an alt-mode with the shape of an organic creature but not necessarily turns them into a half-organic Cybertronian. Edited by Nebula 2.0, Jul 16 2012 - 10:08 PM. IC: ShatterquakeThe part where this guy was adrift in space alone, in stassis, and allowed to come back into a position of command. The message carried a note of disbelief. OOC: I'm off for the night. OOC: Oh well. It was approved like any other profile. OOC: Indeed it was. But I don't think it was intended as an insult. It only really counts when it's OOC. So please, do get back to the RPing. Edited by Basilisk, Jul 16 2012 - 10:23 PM. IC: ShatterquakeIf you had brought the guy back online, you would have stuck him in a little cell, and analyzed every facet of his psychology you could. Shatterquake teased, as he took a set on the transport. He pulled out his shotgun, and started cleaning it. Edited by Inferna Firesword, Jul 16 2012 - 10:31 PM. OOC: All right. XDHowever, unless he's discharged, I'm pretty sure getting stasis-locked by Megatron doesn't warrant any removal of rank. He lost a fight. Unlike the Decepticons, Autobot ranks don't fluctuate because you failed once. IC: Alphonus sighed and took a seat. "To the Matrix Archipelago." The ships started to move. IC: ShatterquakeI can't believe someone put this guy in charge of a squad. It's a darn good thing that I decided to come along, it's only a matter of time til this blows up in Grindcore's face.Shatterquake glared at Alphonus. "Oy. I'm talking to you." IC - Crosswise: The scout stepped onto the same dropship as Painkiller, absolutely sure that Shatterquake would board it. He waved to Firestorm, beckoning her to get onto this particular one. As he popped open a seat on the wall Crosswise retrieved a can of KreamzeekTM Energy Drink and small pack of energon gum from his "backpack." The Autobot pulled out a stick of gum and popped it into his mouth. He offered one to Painkiller as he waited for the rest of the Autobots to get on. "Sounds pretty standard. Don't you do anything with friends, Firestorm?" Crosswise sent the transmission as he buckled himself into his seat.IC - Flatline: The medic silently made his way over to Burning Sky's table with the rest of her Seekers. Flatline wasn't considered a Seeker by Magmatron and was thus drummed out into one of the scouting parties. Perhaps it was for the best though. His alt-mode couldn't catch up the to the more conventional jets and was unarmed. "Medical Officer Flatline reporting ma'am." The medic was carrying a large pile of energon goodie cakes in his two lanky arms. The stockpile of the sweet pastries hid his face from Burning Sky as he stood at attention. Edited by Nebula 2.0, Jul 16 2012 - 10:50 PM. IC: Alphonus looked at Shatterquake. "Acknowledged. How was your day?" He could tell the Wrecker didn't like him, and so he used the sarcastic tone.OOC: They all seem to be on the same dropship, judging by their positions and manner of talking to each other. Edited by TNG Prime, Jul 16 2012 - 10:39 PM. IC: Shatterpoint"Great, thanks for asking, my friend." Shatteroiint replied, his sarcasm clearly evident. "Drop the attitude. What's the mission?" IC: Evo/Joltthey followed suit and boarded.OOC: er... crud. they already left, didn't they? Edited by Wheeljack, Jul 16 2012 - 10:46 PM. IC: "We've been sent to colonize the Matrix Archipelago. All the supplies required are on this dropship. We are to build and hold an outpost until further orders are given." He looked out the dropship window. "Why do you have the attitude, then?" IC: Shatterquake"You had the attitude first, Primesicle." Shatterquake replied.It nearly did. He admitted, the message lacking his usual joking tone. IC: "I behave in the manner I do because it is more efficient for the mission."